“Be a creator, rather than a regurgitator of what is”. How’s that for an opening line – out of the mouth of Abraham, my favorite Law of Attraction source. Couldn’t think of a better way to grab your attention – to the importance of getting your focus off of your present situation and onto what you really do want – that creation that lies beyond your regurgitated status quo. Break the Cycle – Stop Just Re-creating Your Status Quo: Most of us, I’m afraid to say, are just plain lazy (or, at the least, uninformed). We are caught in the habitual trance of just focusing on what is, instead of doing the more structured work of focusing on what we really want. As we get what we habitually and primarily focus on, we just keep re-creating our present circumstances, inadvertently getting more of the same. Same old work, same old relationships, same old money situation, same old weight issues, same old unsatisfying geography etc. We wake up with the ability to create anew each day – but unfortunately most of us don’t take advantage of this amazing ability. Instead, we just keep turning our attention to the same old stuff, so we just re-create the same old stuff over and over again. Never really knowing what we are sadly doing. So it mistakenly looks like we don’t have the power to create anything new in our lives. But we do. Oh, do we! Your Amazing Ability to Create: In order to break the spell and the unconscious re-creation of an unsatisfying status quo, you need to start training yourself to get off of your “now” and onto your true desired state. You need to trick yourself into focusing more on what you really do want, and less on what you don’t (the same ol’ crap). One easy and seemingly simplistic way of doing this is to develop a ‘script-writing’ habit. Start to view yourself as the scriptwriter of your own life – because that is exactly what you are (whether you realize it or not). You create your life. You create what happens to you. If you want to experience changes in your life, you need to take more conscious control of the ‘character’ that is you. You need to start scriptwriting what and who you want to be, rather than staying stuck on who you currently are (unless you really enjoy who you are and what you are doing, if so, then fixate away!). How to Become the Scriptwriter of Your Own Life: How do you become the scriptwriter of your own life? How do you write a good script? Well, I’m glad you asked. You become a scriptwriter by thinking of yourself in the ‘third person’. You make yourself an it (or a ‘he’ or ‘she’). By separating your perspective away from yourself enough, so you can get a bit of an unbiased, observer kind of view on yourself and your life. Then, like a Hollywood scriptwriter, you treat yourself like the interesting, successful main character in the script of a movie or play. However, instead of a tragedy or comedy of errors, you reserve the right to only produce successful and happy kinds of scripts – the kinds of scripts with great endings and lots of good feeling emotions (ok, a chick flick if you must – but these scripts work for both men and woman!). Peter is an solo entrepreneur in the consulting industry. He is doing ok in his current work and life. He’s single. Kind of wishes he could have a significant other in his life again. Is self employed and has been for a while. He likes his strategic planning work with organizations but is not particularly happy with the clients he is attracting or with the level of income he’s reaping. A lot of the time he feels kind of flat line about his life and work and wishes more exciting things could happen to him, like they used to when he first was starting out. Keep It Going Until You Are Complete for Now: Keep writing your script until you feel complete – at least for this scriptwriting session. Its important that you keep the energy and content feeling good. If you write something that doesn’t feel good, erase it and try again. Keep searching around for things that feel good to YOU. Again, specifics can add drag and interference, so if you feel the energy snagging a bit, reach for a more general scenario to feel better again. Our rational minds can get hung up on details, so go high level if this happens to you. General statements often are ‘purer’ in energy than detailed ones – at least to begin with. What You Are Doing: If you haven’t already figured it out, what you are doing with scriptwriting is getting beyond your regular habitual thinking so you can experience something fresher. We get so bogged down in the now that it is very difficult to find the feeling place of something better. Scripts help you find that feeling place. Yes, it is imaginary. But don’t underestimate the power of your imagination. In order to create something more satisfying in your life, you first have to think and feel positively about it. Scripts help you do that. They help you get beyond regurgitation into new creation. Just Do It: Yes, some of this visioning and imagination work can seem a bit strange or perhaps silly at first. Like make believe. And it is. Make believe it is (but silly it is not). If you are feeling embarrassed about this stuff, then keep it to yourself and practice scripts when you are alone or have even just a few minutes to think them out in your mind, you don’t need to always write them out (but writing is a stronger method than just thinking). It might seem strange at first, but what you are learning is a powerful way to bypass your current vibration in order to create a new one. And that new vibration must occur first before real things can start showing up in your physical reality. That is what the Law of Attraction is all about – that which is like onto itself is drawn. The order is ‘be’ then do and have. You have to figure out how to BE it before you can actually have it. Scripts are one of the ways you can trick yourself into being – so you can become a vibrational match to what you want. Author’s Note: I’m currently going through a high study period of the Law of Attraction teachings of Jerry and Esther Hicks and am being heavily influenced by them. If you like the scriptwriting process, check out www.abraham-hicks.com (as these folks are who I’ve learned scripting and plenty of other LOA processes from – they are great!). 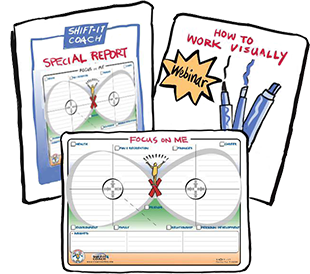 Christina Merkley, “The SHIFT-IT Coach” and creator of the SHIFT-IT Graphic Coaching Process® is a Visioning and Strategic Planning Expert specializing in Graphic Facilitation and Law of Attraction techniques. 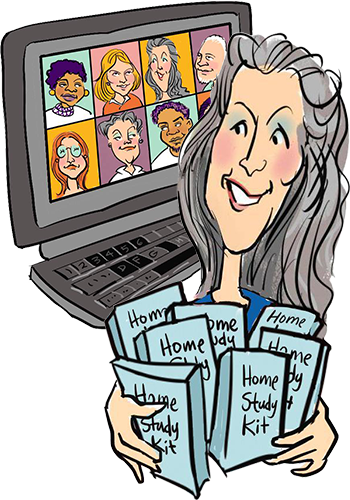 Based in charming Victoria, British Columbia, Canada, she works deeply with individuals, couples and organizations in defining and getting what they really, really want. For more information visit: www.shift-it-coach.com and www.makemark.com.